Constance wishes she had a spurtle. Constance was out of town for the MET’s presentation of Verdi’s Macbeth, but she didn’t mind too much. She is very much looking forward to seeing it live in the upcoming season of Pacific Opera Victoria. 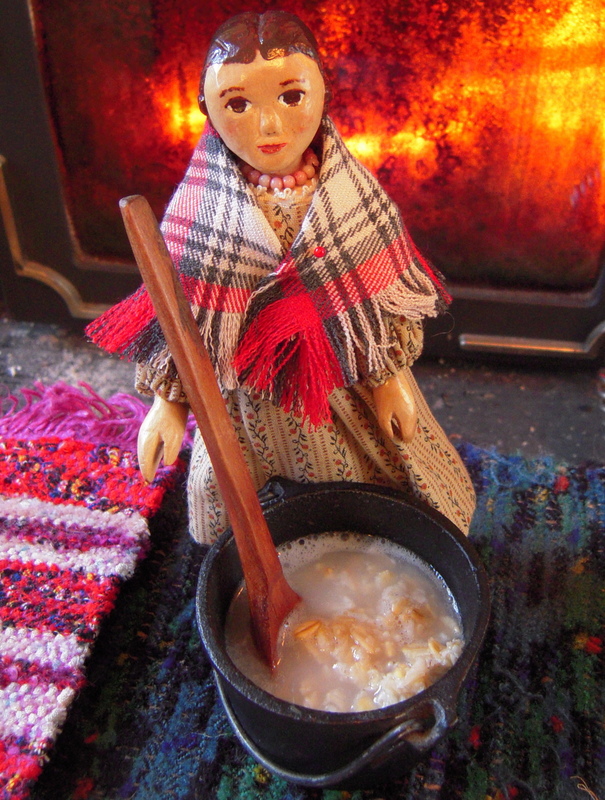 Meanwhile, she made porridge in her cauldron, muttering imprecations. Our Scottish friends consider this a crime. 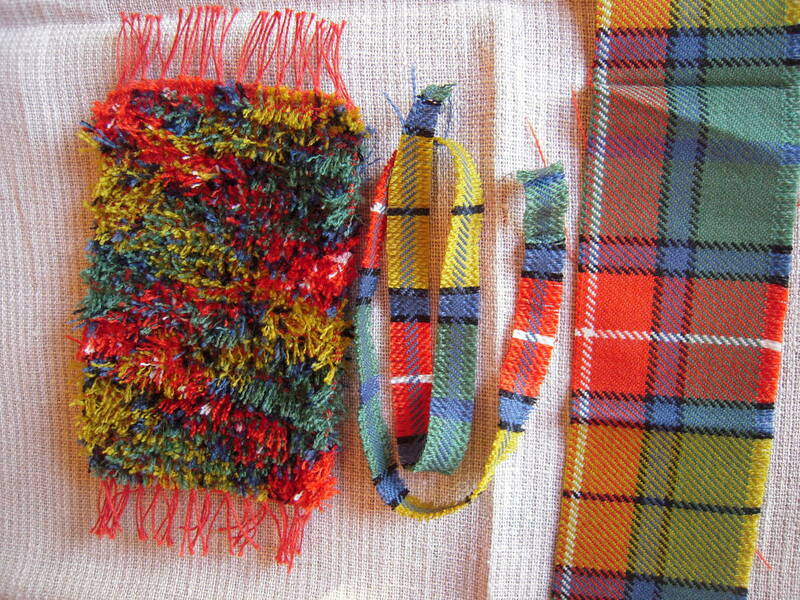 We have discovered that lovely Hitty sized rugs can be woven using ripped up tartan fabric as the warp…. No actual kilts were murdered, we only use scraps from a Kilt Factory! Having some Scottish ancestry I agree that cutting up kilts should be a criminal offense. I am glad to see that the Quimper Hittys seek out fabric that has not yet been sanctified in the form of man-skirt. Sensible small wooden folk. Constance doesn’t want to deprive anyone of their chosen regalia, and finds guys in kilts quite easy on the eyes…. What lovely rugs. The Hittys are so industrious. I’m sure Constance will love the Scottish Opera. Thanks. We’ve made human-sized rugs too, but the little ones get this great Ikat effect. Richness in so many ways….tying together colors, culture, fabric and music! Thank you! Thanks, Becky. We were out of town learning about the Coast Salish first Nation’s weaving tradition, which also involved colours, culture, fabric and music! Lucky Constance – Scottish Opera – What fun – Those rugs using tartan fabric came out so pretty. It will be interesting to see Pacific Opera Victoria’s interpretation of the opera next October! Oh my! How heavenly to have offcuts from a kilt factory- I am truly envious! I shall dream of tartan snips!